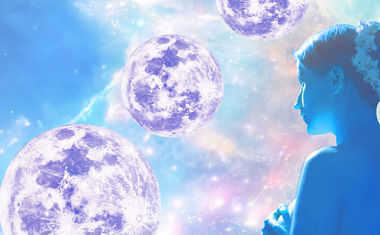 In Astrology, the Full Moon signals a time each month when we are able to take a clear look at what is happening in our lives so we can decide if we need to make changes. But culturally and historically speaking, the Full Moon has additional meaning that changes from month to month throughout the year. Which Moon sign were you born under? Find out this and more with your free Cosmic Profile! 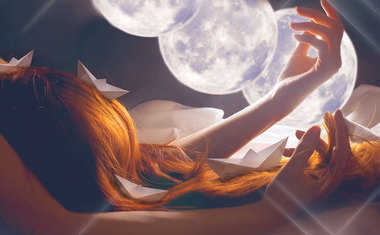 The Full Moon stirs our emotions, so it's fitting that the Full Moon for each month has a different name and personality. 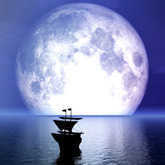 Many of the Full Moon names date back to ancient tribes who followed the Full Moon to help keep track of the seasons. Other Full Moon names have been created by different cultures around the world, and most of the Full Moons have more than one name -- although one is likely more widely used than the others. Let's take a glance at a year's worth of Full Moons! 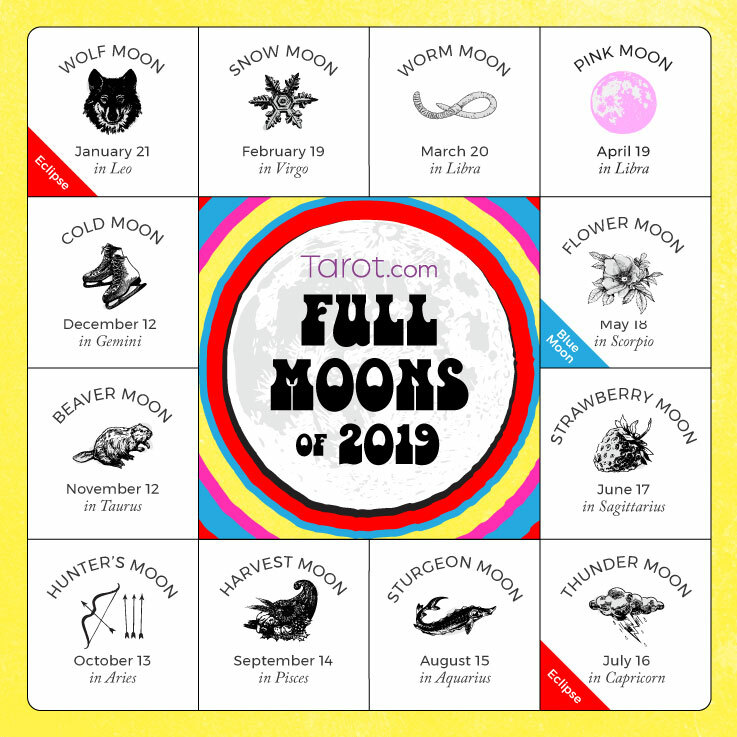 Mark your calendar for the Full Moons of 2019! The Full Wolf Moon in January is named for the time when wolves could be heard howling with hunger in the heart of winter. Alternate names: Snow Moon or Old Moon. The Full Snow Moon in February is named for the time of the heaviest winter snowfall. This is also a time when hunting is more difficult, so it is also known as the Hunger Moon. The Full Worm Moon in March is named for the time of year when the temperature begins to warm, the earth softens and earthworms begin to reappear, followed by the birds. Alternate names: The Sap Moon or the Crow Moon. The Full Pink Moon in April is named for the time of year when the earliest pink phlox and wildflowers begin to bloom. Alternate names: The Grass Moon, the Egg Moon or the Fish Moon. The Full Flower Moon in May is named for the abundance of flowers that begin to bloom this month. Alternate names: The Corn Planting Moon or the Milk Moon. The Full Strawberry Moon in June is named for the time of year the Native American Algonquin tribes would rush to gather ripe strawberries. Alternate names: The Honey Moon, the Rose Moon or the Hot Moon. The Full Thunder Moon in July is named for the frequent thunderstorms at this time of year. Alternate names: The Buck Moon (for the time of year when buck deer begin to grow new antlers), or the Hay Moon. The Full Sturgeon Moon of August is named for the time when Native American fishing tribes could most easily catch this fish in certain lakes. Alternate names: The Green Corn Moon, the Red Moon or the Grain Moon. The Full Corn Moon of September is named for the time of year when Native Americans harvested corn. It's alternately called the Harvest Moon (which is the Full Moon closest to Fall Equinox and can happen in September or October) or the Barley Moon. The Full Hunter's Moon of October is named for the time of year when Native American tribes hunted for the fattest game and stored provisions for winter. October's Full Moon may sometimes be called the Harvest Moon, when this Full Moon falls closest to the Fall Equinox. Alternate names: The Travel Moon or the Dying Moon. The Full Beaver Moon of November is named for the time when Native Americans would set their beaver traps before the water began to freeze over. It's also the time of year beavers begin to prepare for winter. Alternate name: The Frosty Moon. The Full Cold Moon or Full Long Nights Moon of December is named for the mid-winter month in which the cold really takes hold, and nights become long and dark. Alternate name: Yule Moon.